Brandon Thomas Associate Instructor is an independent art instructor who is already a certified art instructor or an artist who has a firm grip in painting wet on wet oil painting (need to be approved first) , but as a BTAI, you get to use Brandon Thomas products and projects in the classroom. How can I become a BTAI? 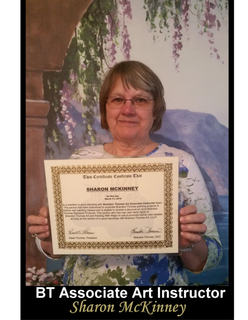 All you need to do is to provide proof of certification or send several of your best photos of your art work and pay a onetime fee of $99 You will get permission to use Brandon Thomas projects, logo and name to promote your workshops and to attract students into the classes. 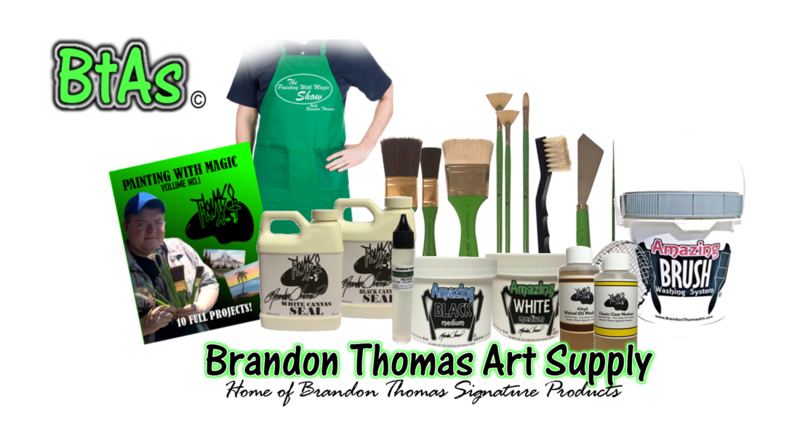 When you become a BTAI you will get 20% off the original price discount on brushes, mediums and other Brandon Thomas products . The only things the discount will not cover are ( Easels, books, video downloads, how to packets and DVDs ). This discount will let you supply your classes with professional brushes and mediums and accessories for your students or you can use this code to re sell brushes to your students or on your website. To get the discount, simply email us your order and we will take 20% off of the total and send you the invoice to pay. When you become a BTAI you will have a listing on our website with your name, phone, email address and a link to your website. This allows people to locate you for your workshops. NO OTHER company list their teachers that are not "Certified or Partners" on their websites! When you become a BTAI you have permission to use all the Brandon Thomas projects in your workshops. This will give you more options for your students and will bring in more students. You will also have permission to use our logo on your website, class signup sheets, business cards and any other promotional materials. When you become a BTAI you will have permission to use the Brandon Thomas name and the Painting With Magic name, along with the Brandon Thomas Art logo for your classes and promotional materials ONLY. When you become a BTAI you will also be sent a certificate through the mail. This will show that you are an official member of the BTAI team and grant you permission to Brandon Thomas projects and the BTAI benefits! When you become a BTAI you will be sent 1 Brandon Thomas Magic Brush Kit. When you become a BTAI you will be sent (1) 10 project book ( Painting With Magic volume no.1 ) to use for projects in your classes. Can my BTAI certificate get revoked ? Yes! If you violate the use of the logo or name(s) (such as slandering the company) your BTAI certificate will be revoked. No refunds. 1. Must be a certified instructor or a proficient artist in wet on wet oil painting (if you are not certified with another company, Brandon Thomas will make the determination of whether you are ready to become an instructor). These are all the requirements you will need to meet to become a BTAI. If you are ready to join our BTAI team, send us an email at brandonthomasart@aol.com with a copy of your certificate from the company where you are certified. Please include your email, physical address, phone number, and website (if you have one). We will send you a PayPal invoice for $99. Soon as you pay, you will be announced on our social media pages and your contact information will be listed on our website.